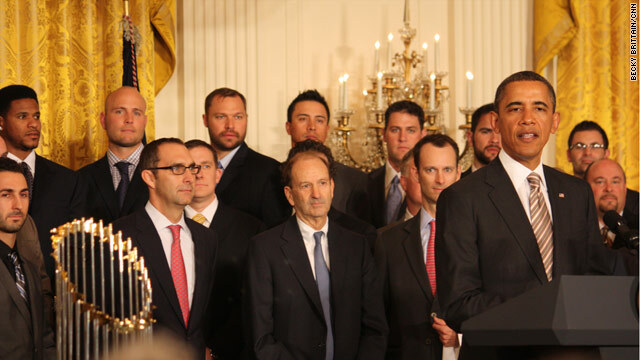 President and Mrs. Obama hosted the St. Louis Cardinals at the White House today to celebrate their 2011 World Series victory. The first lady told the crowd of St. Louis fans that she doesn't normally attend these type events but she wanted to honor the team for their service towards wounded members of the military and their families. "Together we're showing that it doesn't matter who you are, whether you're a Cardinal or a Cub fan or even a White Sox guy," she said while pointing to her husband. "We all can find a way to give something back to our troops and families who've given us so much." President Obama, while disappointed that he wasn't hosting his beloved Chicago team, echoed the admiration and thanked the team for visiting wounded soldiers at Walter Reed earlier in the day. "I won’t lie, I’m a little disappointed I had to leave my White Sox jacket in the closet for another year. But this is a special team, both because of what they do for our military and their families, but also what they did on the field last season," the president said. President Obama also noted that their comeback victory was memorable and unique. "At one point, they had a less than 4 percent mathematical chance of making the playoffs," he said. "Even though they trailed in each of the series that followed, they somehow had the spirit and the determination and the resolve to survive." The St. Louis Cardinals won the 2011 World Series when they beat the Texas Rangers in 7 games. It was the club's 11th season championship title. Probably just as hard as you.